A little piece of history was made by Blackpool Heritage Tram Tours on Sunday 19th February when, for the first time ever, modified Balloon car 713 was used on the basic ‘blue’ heritage timetabled service. This saw the tram employed between Pleasure Beach and North Pier for the day, working two trips to Cabin, and the other tram used was sister Balloon 717. This was also the first time that a tram carrying an all-over advert had been used on the ‘blue’ service. Despite being extensively rebuilt in the mid-2000s and then further modernised in 2010 with widened centre entrance porches and driver-operated plug doors, 713 has been an elusive tram for the last few years. After a few guest appearances on the heritage service in May 2013, it wasn’t used again until October 2015 when it was surprisingly used on ordinary stage carriage work on a small number of occasions. 713 ran just twice last year, and its latest outing coupled with use on both days of the first ‘Gold’ operating weekend in January, means that it has already been used more in 2017 than it was in the whole of 2016! 713‘s unexpected use on heritage tours on February 19th is just the latest in a growing number of such appearances by the modified ‘B Fleet’ Balloons of late. No doubt the cold winter weather makes the use of these heated vehicles more appealing, whilst a few defective trams and limited access to the Rigby Road depot due to ongoing roof repair work have further restricted the number of options for trams to choose from. 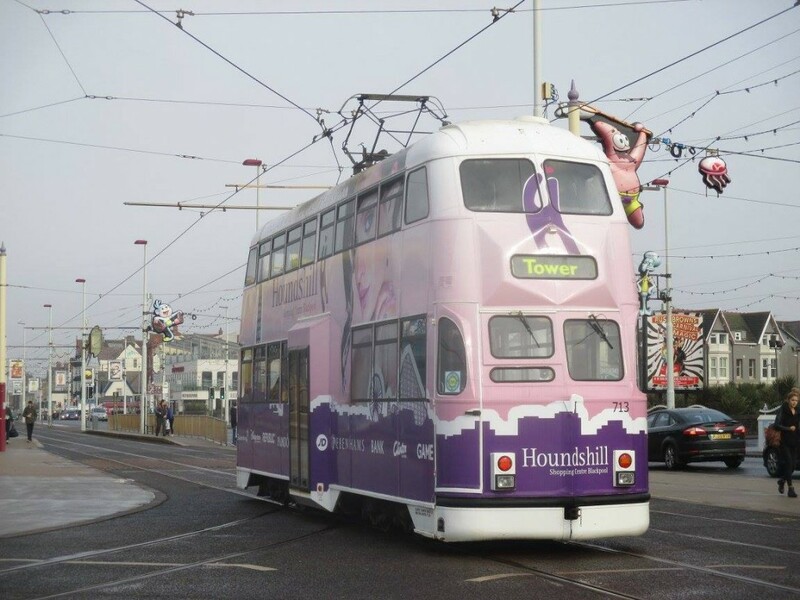 It seems that this tram and its stylish pink, purple and white advert livery for the Houndshill shopping centre could well be making a few further appearances on the tramway although its long-term future use in this guise is by no means guaranteed – so catch it if you can! 11 Responses to Pink on blue! Hi, Am I not right in thinking that when an organisation pays for advertising their product, there would surely be a contract stipulating the amount of time that visibility of the product was on display to the public? I asked this question and all adverts on the B fleet are expired. All the others are now incorrect and would require replacing or modifying (though Lyndene surely isn’t!). There is an agreement in place with Hounds Hill to run the expired advert. As mentioned some weeks ago Its reminiscent of true Blackpool use, the use of this tram and others still in advertisement colours shouldnt be knocked, there working and fit for service. To much standard livery may be ideal in some ways but Joe public remembers something else, when those lovely new trams get a bit dog eared wont be long before the wraps go on. You want the trams of yesterday to be representative nows the chance. Dave, you clearly don’t remember the constant barrage of complaints about the contravision then! I like adverts and I’d love to see classics represented in the fleet but not contravision. There will have been a contract for the advert, which I expect has expired. It’s unlikely that the advertiser would object to continued promotion after expiry of the contract unless the imagery and messaging was no longer accurate. Plenty of expired adverts ran in the past, particularly in the spring pending new contracts replacing them during the year. Whilst remeniscent of Blackpool practice – an all over advert with contravision on a premium price Heritage service? Really? Well its heritage tramway, just what you have, worked in that condition, earned money and transported people. Represents a true phase of use, credit to the heritage staff for the output. What about WINDSORS SHOES that looks like a mobile wall. Those rather garish colours are awful but in a funny way acceptable in Blackpool but not at Beamish. just as other collections should be true to life. As a collector of many things the perverse is better than the mundane, ask the public to comment as the judge. Just to dampen the response I have contributed to a fund run some time ago which gave a some of money towards repainting stock OMO 8 whenever that might ocour. Give Brian and his team some space and he will come up with the goods, better than subjects not in public view or sterile reconstructions. Preserved trams often have historic advertising. Sunderland’s famous ‘Shop at Binns’ comes to mind. Overall adverts are part of a tram’s history. Many trams in the past used to carry cigarette advertising. Would a museum dare to put an advertisement for a defunct brand on the side of a tram? Or would it be prosecuted under current laws?